olive oil and shrimps. Cook on medium heat until the shrimps start to color. Add garlic and pepper, lightly season with salt and pepper and cook for 1 minute. Add tomatoes and herbs, cook for 1 to 2 minutes more and deglaze with Ouzo. Remove the shrimps from the skillet and keep warm. In the same skillet, add zest, lemon juice and feta cheese, simmer for 2 to 3 minutes or until you obtain a smooth, creamy texture. Place the shrimps back in the skillet, season to taste and serve at once. 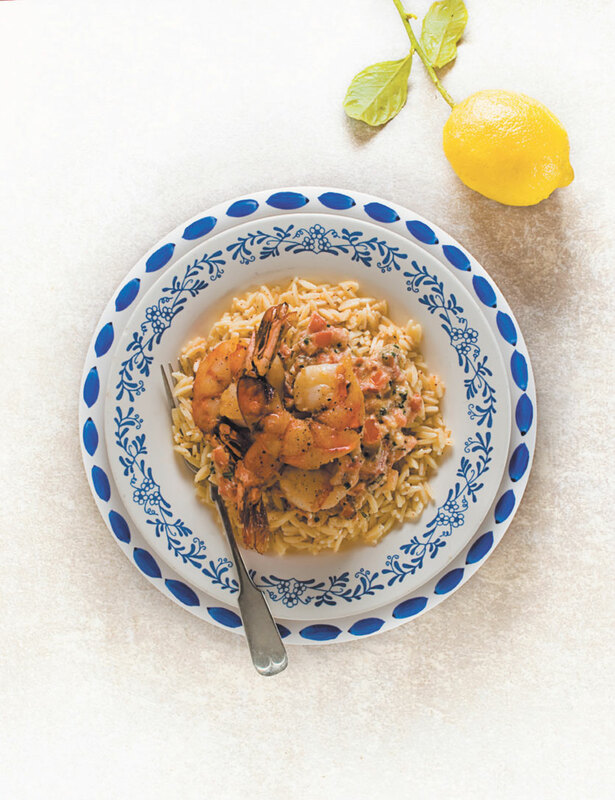 FINALE — Serve the shrimps with sautéed rapinis – page 45 and orzo (or any pasta) with olive oil.